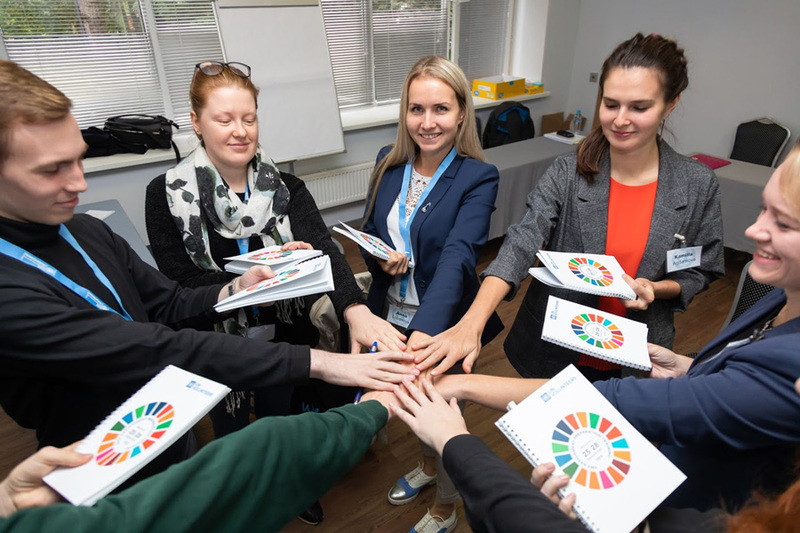 Last week, 14 UN Youth Volunteers from the Russian Federation took part in an assignment preparation training (APT), before embarking on their UNV journeys in 13 countries around the world. Russian UN Youth Volunteers during one of the sessions at their assignment preparation training in Moscow. The training started with welcome addresses from Ravilova-Borovik, representative of the Ministry of Foreign Affairs, Alexander Averchenkov, Manager of the Russia-UNDP Trust Fund, Vladimir Kuznetsov, Director of the UN Information Centre in Moscow, Diana Djalalova, representative of the Association of Volunteer Centres in Russia, and Olga Zubritskaya-Devyatkina, UNV Chief of the Volunteer Solutions Section. During the training, UN Youth Volunteers gained a deeper understanding of how volunteerism can advance progress towards the Sustainable Development Goals (SDGs) and how they can successfully engage in their assignments across Africa, Asia and the Commonwealth of Independent States. UNV training is not just one of the usual team building activities that we are all used to. There were no bored colleagues, nor the strained smile of coaches working off their salaries. Only passion for the common cause and craving for self-improvement. I am sure that each of us learned lots of useful information. But the main thing is that we have found each other. Just imagine, if at one moment you had friends all over the world! --Dmitry Lutsenko, UN Youth Volunteer in SDG Communications in Uzbekistan. Volunteers explored and practiced leadership, conflict management and communication skills, and learned about identity and inclusion, living and working in a cross-cultural environment, personal and professional development, and peer support and knowledge-sharing. Additionally, the UN Volunteers were given the opportunity to discuss the role of youth in achieving the SDGs with Toily Kurbanov, UNV Deputy Executive Coordinator, who shared some useful tips with volunteers, talked about challenges and success moments, career development and his experience working with UN Volunteers. All sessions were extremely insightful, and I learned a lot about fundamental skills we need to acquire and improve in our work with the UN. I hope to be able to make a meaningful contribution and grow personally and professionally during my assignment. --Nina Tabinaeva, UN Youth Volunteer in Partnership and Resource Mobilization with the United Nations Development Programme in Ethiopia. After having completed their training, the UN Youth Volunteers are now fully equipped to start exciting new chapters in their life. They will serve with the United Nations Development Programme (UNDP), the United Nations Office on Drugs and Crime (UNODC), the United Nations Population Fund (UNFPA) and the United Nations Entity for Gender Equality and the Empowerment of Women (UN Women).